E-learning can be one of the best ways to train your workforce. It allows you to maximize learning time, minimize learning costs and provide a quality training experience. You can go a step further by customizing the e-learning program. Tailoring an e-learning course to specifically meet a company’s requirements, work culture and target audience can help you create a world-class e-learning experience for your organization. Catalogues or off-the-shelf courses usually cover generic topics such as, team building, change management, negotiation skills, effective customer handling, etc., Although Subject Matter Experts SMEs) usually develop these courses, their purpose is limited only to gain information and not any sort of certification or degree. Customized e-learning solutions on the other hand, are developed to meet the organization’s unique needs. They are developed after thoroughly analyzing the training needs and identifying the gaps in knowledge or skills. It addresses the organization’s learning objectives effectively and is customized by including examples, processes and situations relevant to that organization. Since off-the-shelf courses are developed to cover general topics for a general population, it might have information that is completely irrelevant to your employees. This might put users off and decrease knowledge retention rates. The course may be inappropriate for your geographically diverse workforce, since it does not consider cultural sensitivities. The duration of these courses may be too long to suit your employees’ time availability, which may further discourage effective learning. Organizations have their own set of business goals to achieve. Employees need to hone their skills in order to achieve these goals. Your training program must be aligned to improve specific employee skills. With custom e-learning, content can be linked to real-life scenarios to create meaningful and relatable courses that can be directly and immediately applied to the job, to help employees achieve their goals and targets. The initial cost of developing a custom e-learning course is high, but rest assured, this money is in the right place. To update a custom e-learning course is quick, easy and inexpensive. Professional Instructional Designers and developers can organize your training product to allow hassle-free editing and maintenance. 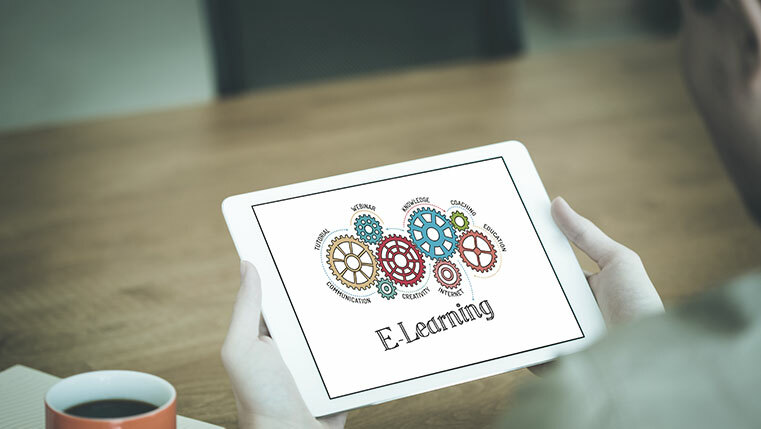 Another reason to opt for custom e-learning is the freedom to modify content as and when required, without having to wait for new releases of purchased products. They surely provide a greater return on investment in the long term than off-the-shelf courses. Custom e-learning gives an opportunity to strengthen your brand image and values. The course can sit within a custom-designed layout, using your corporate colors and logo, so it is instantly recognizable as an asset of your organization. Content that reflects your company’s values and principles can go a long way in creating a committed and loyal workforce. A course that speaks the language of your company will have a lasting effect in your employees’ minds. Learner motivation and engagement is influenced by many factors, including how meaningful the content is to the learner, creative devices used, and the length and structure of topics. Custom e-learning allows you to control all of these aspects and thus keeps your learners interested throughout the training. Assessments are important for determining how successful your course has been. Fine-tuning the assessment process not only gives course designers important feedback, but also reinforces the entire course for the learner. A targeted, specific assessment strategy, can help learners retain fundamental and advanced learning concepts long after the course has been concluded. E-learning solutions are extremely profitable for companies. Customized e-learning makes sure that this profitability lasts in the long term. A custom e-learning program not only provides a higher quality of training but is also more convenient and reduces logistical costs. It increases employee performance and improves the brand image of the company. If you value an integrated and highly effective workforce, then investing in a customized training program is your next step to success.